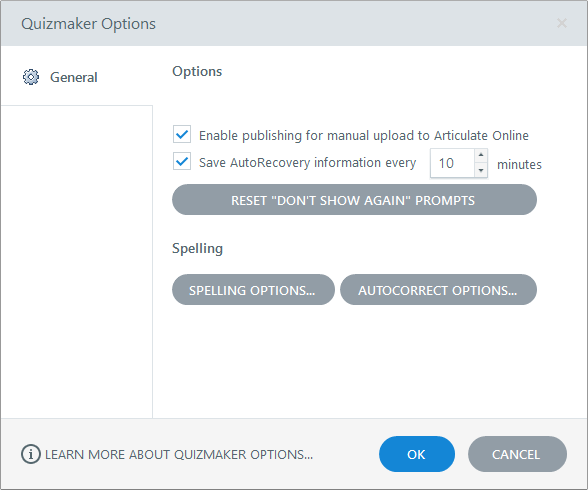 Here's how to take advantage of Quizmaker 360’s auto-recovery and spell-checking features. Go to the File tab on the Quizmaker ribbon and click Quizmaker Options. The following window will appear where you can adjust the options described below. Quizmaker will automatically save a copy of your project at the specified interval (after you’ve saved it at least once). The default interval is every 10 minutes, but you can enter any whole number between 1 and 120. If Quizmaker closes unexpectedly, you’ll be prompted to recover your quiz, the next time you open it, from the last copy Quizmaker stored in memory. For some actions, such as deleting audio, Quizmaker displays a confirmation prompt with an option to "Don't show again" or "Don't ask again." If you mark the box, Quizmaker will no longer display the confirmation prompt when you perform the same action later. This hides the wavy red lines that normally appear under misspelled words. (When you run a spell check, the misspelled words will still be caught.) If you choose to make the wavy red lines visible, you can right-click any misspelled word for a list of suggested spellings. If a misspelled word appears to be two separate words, Quizmaker will suggest splitting them apart. If a misspelled word resembles the phonetic spelling of an actual word, Quizmaker will provide suggested corrections. During spell check, Quizmaker will provide suggested corrections that are typographically similar to the misspelled word. For example, if you type "potatoe" the words "potatoes" and "potato" will be suggested. This enables Quizmaker to distinguish words based on the case patterns of their letters. This enables Quizmaker to dynamically correct misspellings as you type. If you mark this box, you can also click the corresponding Options button to customize your autocorrect dictionary. See the section on Setting AutoCorrect Options for details. Click Custom Dictionaries to add, modify, or remove a custom dictionary. Custom dictionaries supplement your main dictionary with additional words that you don't want Quizmaker to flag during spell checks, such as names, industry-specific words, technical terms, and alternate spellings. To add a word, type it in the Word field and click Add. To remove a word, select it and click Delete. Click OK when you're done. Click New. Type a name for your new dictionary and click Save. The new dictionary will appear in your dictionary list, and you can add words to it as needed. Import a custom dictionary you receive from someone else. Click Add, browse to the *.dic file, and click Open. The dictionary will appear in your dictionary list, and you can modify it as needed. 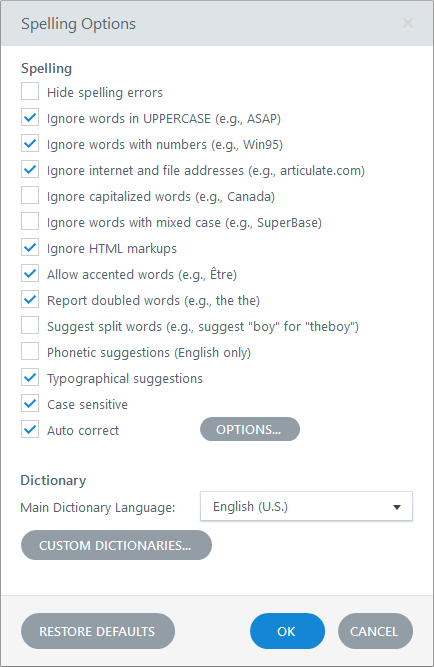 Select the dictionary you want to remove and click Remove. This doesn't remove the *.dic file from your hard drive, but it does remove it from your dictionary list in Quizmaker and other Articulate programs. The autocorrect options let you choose which misspellings Quizmaker will automatically correct. 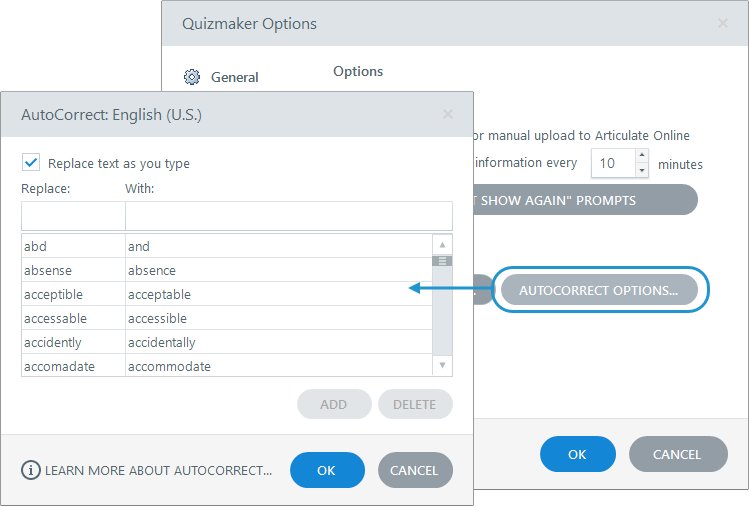 You can access these options either by clicking the Options button on the Spelling Options window shown earlier in this user guide or by clicking AutoCorrect Options on the main Quizmaker Options window (shown below). Type the word you want to add in the Replace field. Type the word you want to replace it with in the With field, then click Add. Select a word in the left-hand column, type the text you want Quizmaker to replace it with in the With field, then click Replace.